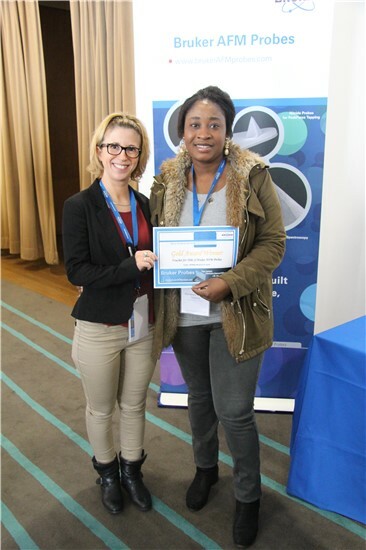 Marie-Lise Perrault, and Abimbola Feyisara Adedeji, Gold Award Winner of the BRUKER's Price. Bruker Nano Surfaces invites you to Bruker Workshop & Training Day, an AFM Workshop with hands-on training on Wednesday on 11th April 2016. This workshop will present the new advances in Atomic Force Microscopy for Life Sciences. If you wish to participate at participate at Bruker’s Training Day, do not miss to select this option. Space is limited. Understanding chemical, mechanical and structural properties of small molecules and complexes in their native state remains important for many research groups. To realize this task, be-sides high spatial resolution, to which AFM is known for, high force sensitivity is required. Various even gentle AFM modes however are not capable to maintain precise force control when working with soft samples like biopolymers or living cells in vitro. In this lecture we will present what is so unique in Bruker’s proprietary PeakForce Tapping mode that enables to publish more than thousand publications in high impact journals by various researches within last 5 years, with the majority of them coming from life science. We will show how PeakForce Tapping technology combined with chemically functionalized probes made possible to localize single biologi-cal and chemical sites on native proteins and on living cells at high resolution. In the last years, Atomic Force Microscopy has become a pow-erful tool not only to study the surface morphology but also the nanomechanics of all kind of samples. Together with the recent evidence that the deformation characteristics of cells represent a potential biomarker of cells’ disease status, makes it a suitable instrument to diagnose cells state. In this lecture we will present recent technological advances for accurate and fast mechanical mapping using Bruker technology. We will demonstrate how we probe samples elastic properties by us-ing multi-frequency sinusoidal PeakForce Tapping mode and linear FASTForce Volume mode. During this workshop, we will use the Dimension FastScan Bio AFM to visualize DNA and DNA self-assembled structures in liquid with high spatial and temporal resolution. DNA self-assembled structures (also known as scaffolded DNA origami) are small nanoarchitectures with a large variety of geometries, topologies, and periodicities. Modified by functional groups, those DNA nanostructures could serve as scaffolds to control the positioning of other molecules, and study such processes like protein-protein interactions or build artificial multicomponent nanomachines. FastScan Bio Nanotrack software will be used to continuously track this mobile sample with the possibility to compensate for any intrinsic or extrinsic movements. We will investigate real-time dynamics and structural changes of these self-assembled DNA structures using on-board MovieMaker software. During this workshop, we will use the BioScope Resolve AFM to visualize and map mechanical properties of cells and soft materi-als in high resolution. We will demonstrate how latest PeakForce Tapping innovations, including the new nanomechanics package and dedicated life science probes, could significantly expand mechanobiology applications of the AFM. We will present how novel MIROView optical-AFM integration workflow enables seamless navigation and automated scanning using different scanning modes over various locations. The workshop will in-clude a real-time demonstration of the functional synchroniza-tion of light microscopy techniques with AFM in order to conduct time correlated optical and AFM imaging. During this workshop, we will use the MultiMode to visualize DNA in air. We will demonstrate how the latest PeakForce Tapping innovations and software improvements boost speed and throughput, accelerating statistical studies. We will present new multi site imaging as well as PeakForce Tapping at 8kHz in air and at 4 kHz in liquid. The workshop will include a real-time demonstration of force curve & FASTForce Volume recording and post-processing of acquired data.